Kat - In the film Superman III, the so-called Man of Steel becomes a man of coal, crushing a lump of the black stuff in his fist to create a huge, glittering diamond. It's a neat party trick, and helped to reinforce the idea that coal - which is basically carbon - can be converted into diamonds, which are also made of carbon, by applying enough pressure. But, just like the man with his pants over his tights, the idea that diamonds are made from coal is fictional. So what's the true origin story for these sparkling gems? According to geological studies, natural diamonds were formed over a billion years ago, created from the forces of extreme pressure and temperature deep underground in the early earth to convert carbon-rich minerals into bright diamonds. And we're talking serious stress here - the kind of pressure that's found up to 150 kilometres down in the earth, and temperatures of more than a thousand degrees Celsius stoked by molten magma in extra-deep volcanoes. These volcanoes then erupted up towards the surface of the earth, pushing up magma that formed types of rocks known as lamproites and kimberlites - named after the South African diamond-rich region of Kimberly - along with any diamonds that came along for the ride. It's these rocks that are mined for diamonds in places such as central and South Africa and shipped around the world as tokens of love, although sadly in some cases also fuelling arms trading and bloody conflicts with the profits. 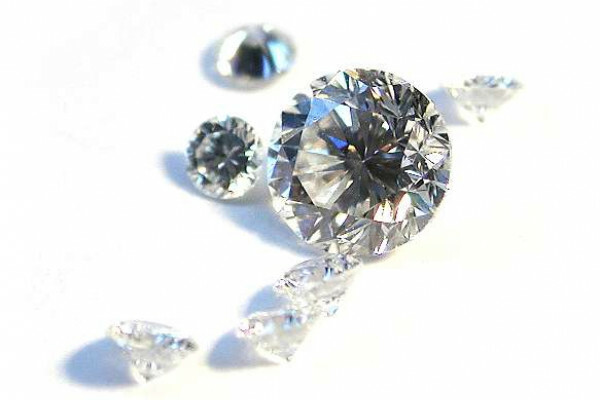 Diamonds can also form in the so-called subduction zones, where one plate of the earth's crust containing a seafloor slips under another. Based on chemical analysis of diamonds formed in this way, carbon-rich rocks in the seabed are thought to get crushed and transformed into gems, rather than coal. There are a couple more ways to make diamonds too - neither of which involve coal. One is at the sites of high-impact asteroid strikes, which would generate the extreme temperatures and pressures required, and the other is through similar impacts happening in space, with the resulting tiny diamonds falling to earth embedded within meteorites. By contrast, plants, which give rise to coal as they fossilise, weren't even around until about 450 million years ago and coal didn't even start forming on earth until three to four hundred million years ago - a few hundred million years too late for diamond formation. The oldest land plants are younger than any natural diamond, so the timing doesn't work out for a start. And coal isn't ever found as deep down as the places where diamonds are believed to form. Then there's the chemistry. Diamond is a crystalline form of pure carbon, neatly arranged with each carbon atom strongly bonded to four other carbon atoms, while coal is a much more random, higgledy-piggledy assembly of atoms, along with a whole bunch of impurities. But there's another form of carbon that can be converted to diamond under the right conditions, and that's graphite, which is made of thin sheets of carbon atoms joined together in hexagonal rings. By applying extremely high pressure and high temperature - known as HPHT - it's possible to convert graphite into diamond, although it's a tricky method that isn't used much any more. Or, if you prefer a showier way, you can just use high explosives to blow up some graphite, although you'll only get teeny tiny diamonds out of it. But if you do fancy playing Superman, there is a reliable way of creating diamonds from carbon, even if you lack his super-strength (but have some super lab equipment). CVD, or chemical vapour deposition, is a technique that creates diamonds by adding vaporised pure carbon atoms one by one onto a tiny diamond seed. So the most romantic use for a lump of coal is to put on an open fire, creating a beautiful backdrop to handing over a diamond ring. Next Are we building over biodiversity?